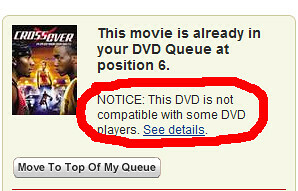 This is because Netflix still has a few Movie titles with the asinine ARccOS copy protection. ARccOS is a copy protection scheme developed by Sony that intentionally puts corrupted sectors on the DVD to prevent copying. It also tends to make the DVD unwatchable on several different DVD players on the market. 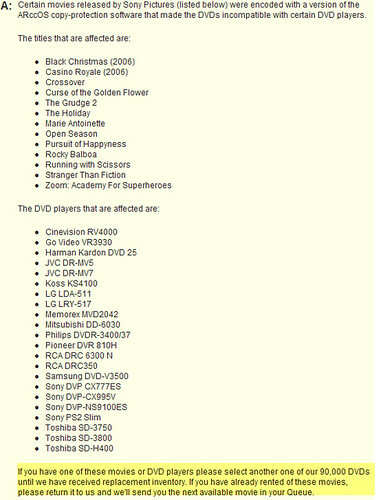 It should be noted that Netflix has been replacing their inventory of these Discs and now only have these 13 titles. Here’s the FAQ on the Netflix site about the ARccOS discs. This is just another reason I hate these copy protections that manufacturers are putting on media. It tends to penalize the legitimate customers and treat them like criminals when those who are ripping and selling the content on the streets will still find a way to do it. In the end it costs you and me money and limits the functionality at the same time.